Pink Alliance is able to support breast cancer patients because of many generous donors. We are tickled pink and thankful for those who donated in 2013. Members of the Bridal Association of the Brazos Valley held their year-end meeting at Double Creek Crossing near Caldwell on Tuesday, April 15. Thanks to the success of recent bridal shows, the Association honored the Pink Alliance, its designated charity for 2014, with the presentation of a $9,845 check to support local breast awareness and cancer support needs. The Pink Alliance serves as the Brazos Valley’s advocate for breast health and cancer support by providing reliable, informative resources; inspiring hope through individual and group support; and offering access to medical treatments for those with limited means. 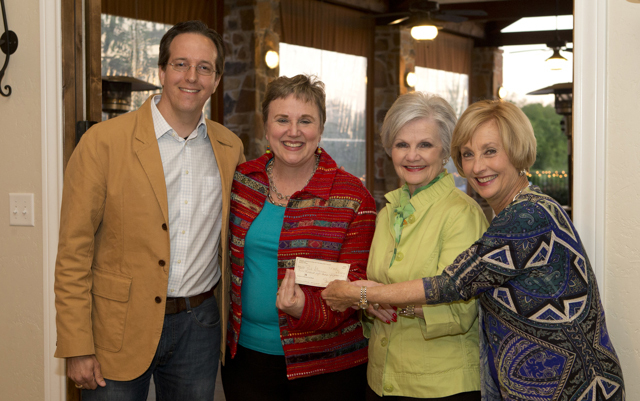 Bridal Association President Travis Rollins presented the check to Pink Alliance Board Members Patricia Gerling, Reba Ragsdale and Janie McDougal [left to right].